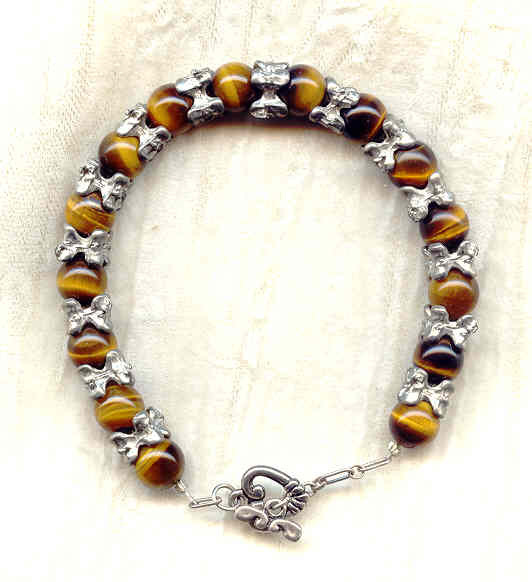 Here's a bracelet with a bit of a different look: tigereye fashioned into 10mm round beads that have been polished to a velvety glow, alternated with pewter spacers in the shape of vertebrae. The pewter pieces were cast especially for SPARKLE PLENTY, and are lead- and antimony-free (kind to both your skin and the environment). The pewter heart toggle is attached to the beads with a bit of sterling chain for maximum flexibility. The strand is about 7-3/4" long, and we'll happily adjust it at a buyer's request. We're quite accommodating here at SPARKLE PLENTY. Velvety tigereye beads, drops, and focal show to advantage next to pale gold Swarovski crystal pearls. The Egyptian-patterned polymer clay beads are the work of the talented folks at Blue Chili Designs.